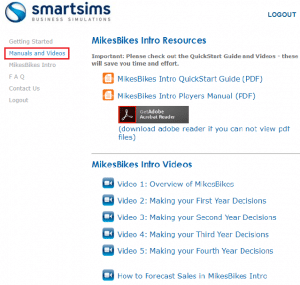 MikesBikes Introduction is our Introduction to Business Simulation. When the simulation begins, you will be sent your login details by either your instructor or by Smartsims. Log into the Smartsims website with the login details you have been given. You may need to register for your simulation. Access our available resources under the Manuals and Videos tab from the left-hand menu. Launch your company by clicking on your simulation name on the left-hand menu, then clicking on the blue launch button. For more information, please view our step-by-step guide on how to log in, register, access the simulation and view all of the resources available to you. Rollover is the term used to describe moving from one year (decision period) to the next. A Rollover will process your currently entered decisions in the simulation for the year ahead. MikesBikes Introduction has two phases of the simulation. It is important that you know the difference between these phases, and that you are entering your decisions in the correct World. Some courses will not use the simulation as described below, please check your Course Outline for more information. Single-Player Phase: In the Single-Player you will compete against a single computer-controlled competitor. In the Single-Player you are able to roll forward into the next decision period/year or roll back as you wish in order to test and change your decisions. Multi-Player Phase: In the Multi-Player you will compete either individually or in teams against other student-run companies in your class. Moving from one year (decision period) to the next is done by automatic rollover on pre-set dates scheduled by your instructor. The MikesBikes Introduction simulation is designed to help you build confidence in each decision area which is designed to expand your knowledge and experience in Sales and Marketing, Distribution, Operations, Product Development, and Finance. Player’s Manuals: Which explains in detail each functional area of the simulation. Quick Start Guides: Give a brief overview of the simulation and each functional area. Video Tutorials: Our tutorials take you through an example process of analyzing reports and making company decisions. How Do I Launch A New Product In MikesBikes Introduction?